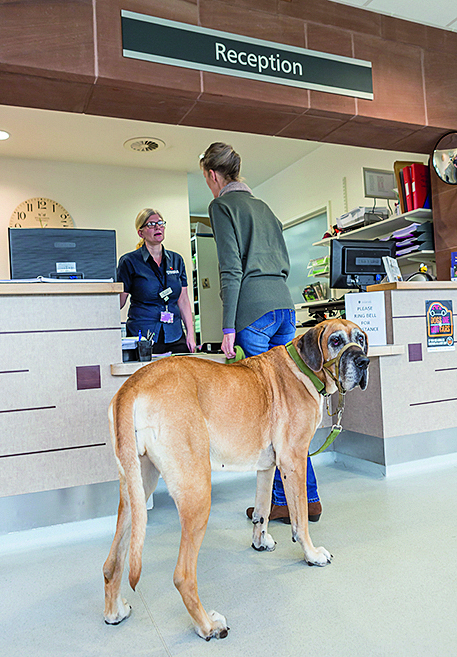 In the myriad corridors behind the waiting rooms lie the wards – dogs on the left and cats on the right. 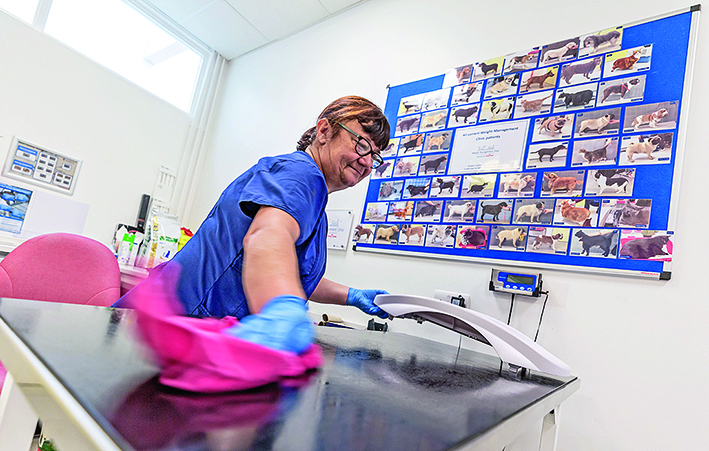 Robyn Richards, a patient care veterinary nurse, is responsible for doing the four-hourly checks on all her patients who may have had surgery, a procedure or a treatment. “We check their temperature, breathing and whether they’re eating and drinking normally, while keeping them as quiet as possible to recover,” she explains. 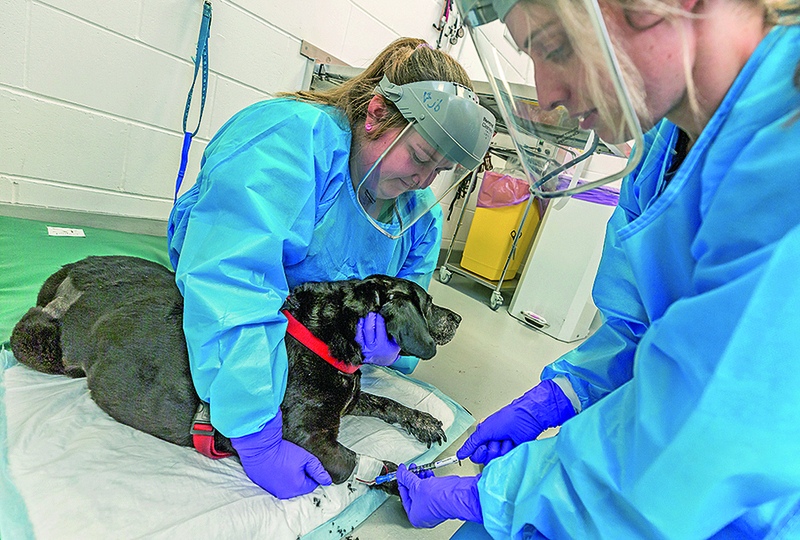 Fifth-year veterinary student Beth Griffiths has spent theweek working closely with inpatients, helped by the nurses and clinicians. Work includes preparing food before surgery and following cases right through to post-op. One of her patients is Jasper, a three-year-old springer spaniel with a foreign-body reaction. A grass seed he swallowed has caused swelling and infection in his throat. “A vet and I will discuss next steps after Jasper has had CT and ultrasound scans to try to identify how easy the seed will be to remove. We’ll speak to the owners when the best course of action is agreed,” explains Beth. 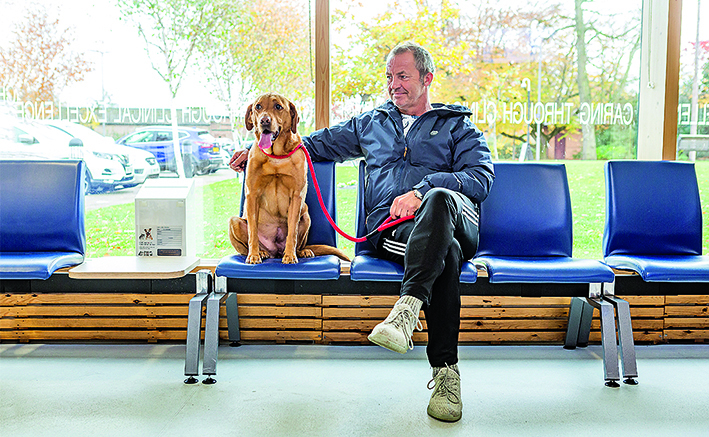 Graham Dewhurst travels from Preston every four to six weeks to bring Foxy, his seven-year-old fox red Labrador, for scans and check-ups. Foxy has had three major operations after being diagnosed with cancer over a year ago. Today, she’s the picture of health and taking everything in her stride. 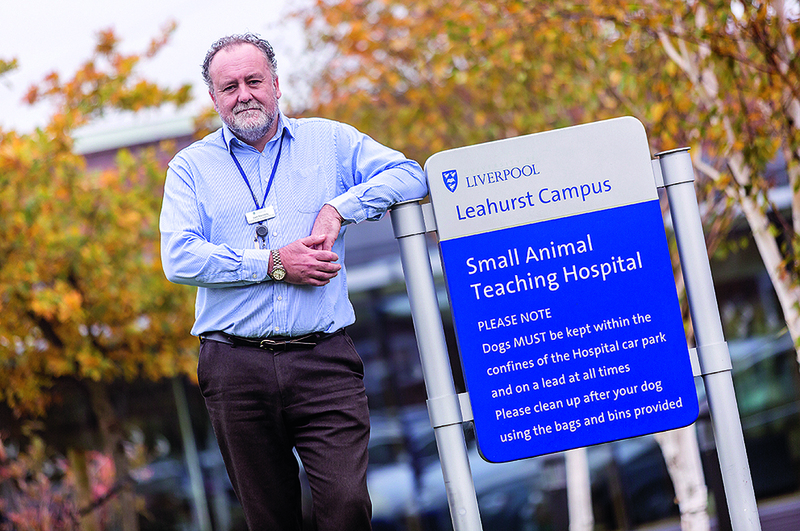 “She’s the light of our lives,” says Graham, who can’t thank the staff enough for helping her fight the Big C.
The SATH plays a key role in the education of fourth- and fifth-year veterinary students, teaching them the very latest concepts and techniques in a caring and supportive environment. 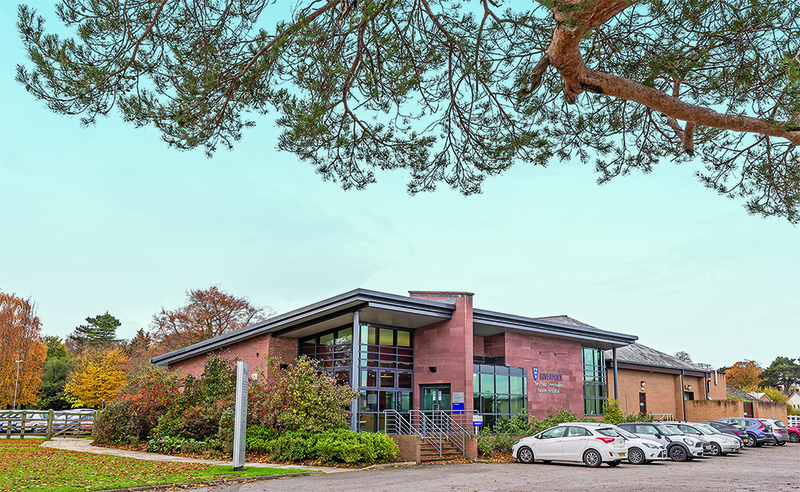 Students have the opportunity to experience a wide range of specialisms including cardiology, dermatology, internal medicine, neurology, oncology, orthopaedics and soft-tissue surgery. Every morning, they are allocated time to write up their clinical notes in the student study area. “We will let Connie settle in to her new surroundings before she is seen by the consultant surgeon David Stack later,” explains Giulia. 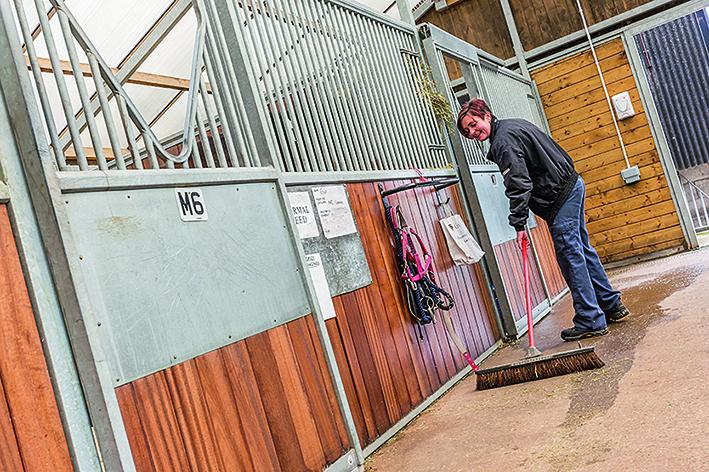 On the general equine ward, Sophie Neil is ensuring the stables are spick and span. As a yard technician, Sophie is responsible for the aftercare of the horses on her shift, which includes mucking out, feeding and administering medicines. In addition, she may be called on to support the six-strong nursing team led by Jane Devaney, doing anything from assisting with an MRI to holding horses for vets’ and students’ rounds. The hospital uses more than 40,700kg of hay in a year – the same weight as seven African elephants! 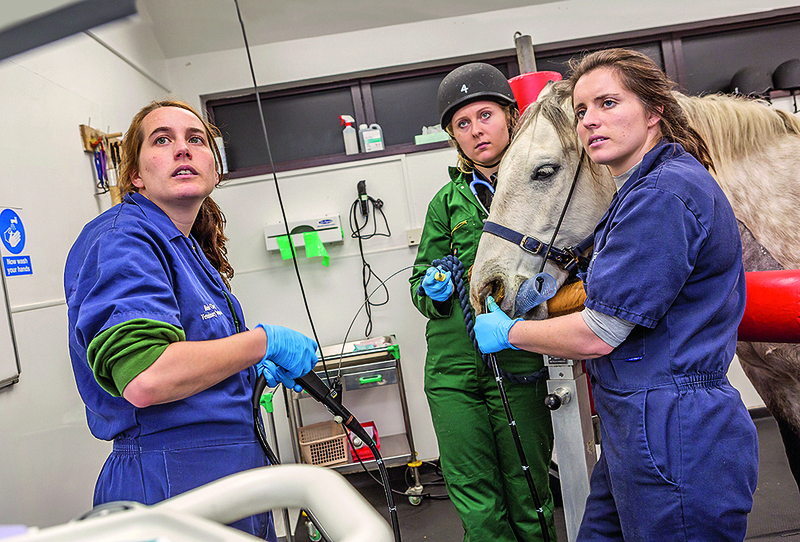 Resident veterinary surgeon Rosie Olley has been at Leahurst for eight years. “Today’s patient is a very poorly boy with a stomach impaction as well as an abscess in his neck. We’ve sedated him to perform an endoscopy and do a biopsy on his duodenum. 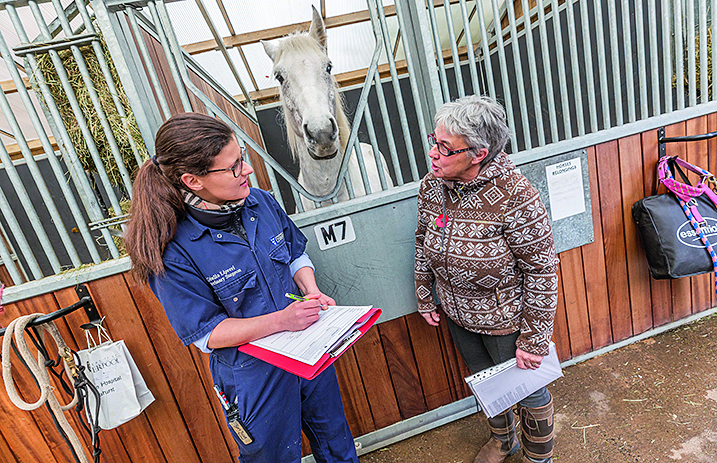 As horses don’t have gall bladders, the bile ducts have to be checked too.” They use stocks to keep the horse in a safe position for him and the staff treating him. Rosie has her teaching hat on today and is explaining hospital techniques to her student and intern using a camera and monitor. 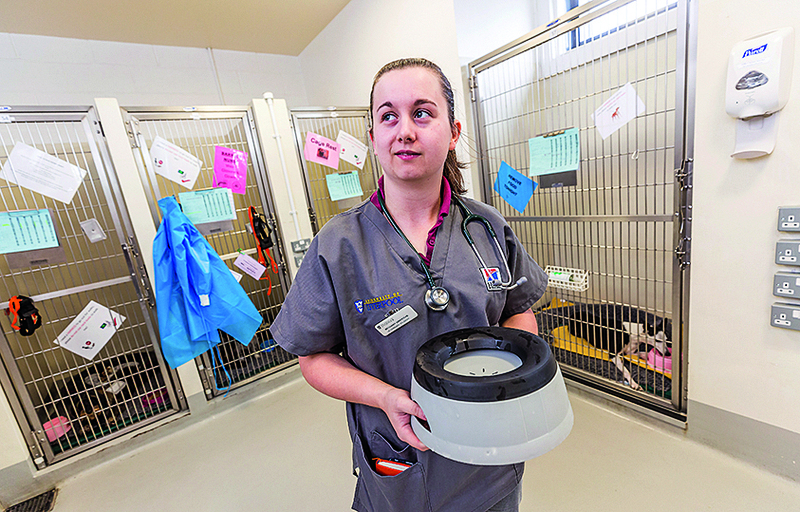 Veterinary nurse Katy Dorricott enjoys her role as pharmacy administrator. Work begins at 7am sharp, when the first delivery arrives from the wholesaler to supply all areas of the Equine Hospital. 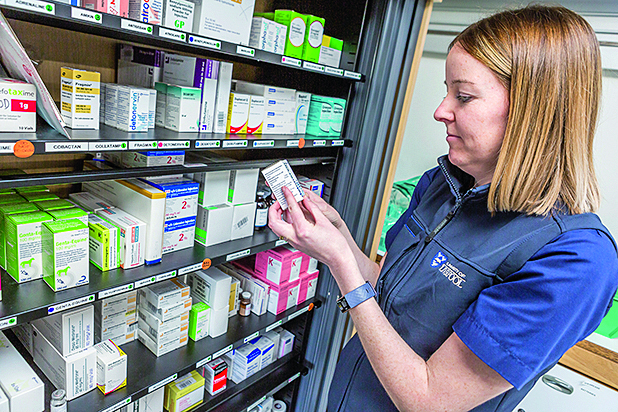 “We get multiple deliveries through the day as we never know in advance what emergency treatment may be needed.” Every year, the hospital uses roughly 26,000 litres of saline and 42 kilometres of bandaging material – the length of the London Marathon! 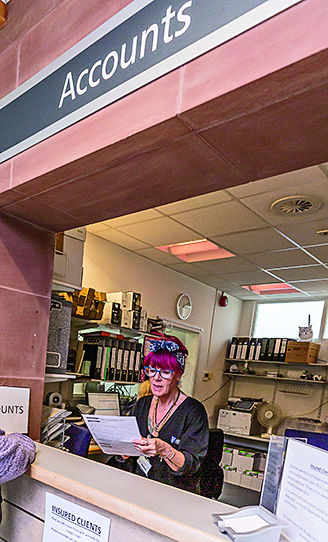 “As well as making sure all medicines, bandages, surgical items and so on are replaced, recorded and stored correctly, I’m often asked by the vets to research and procure specific drugs and surgical equipment from outside the UK, including Europe and America,” adds Katy. 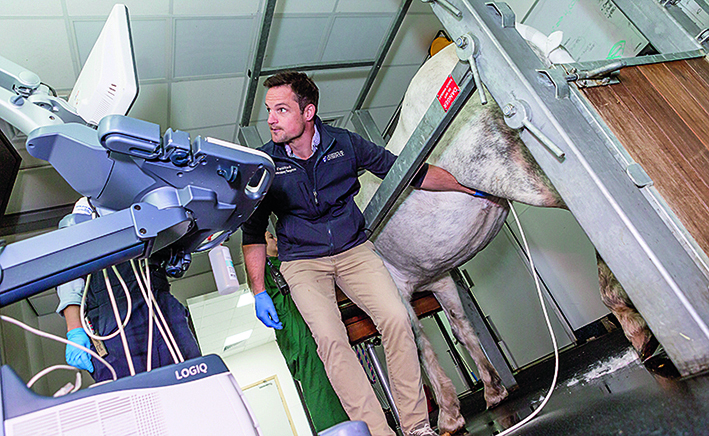 The senior lecturer in equine surgery, David Stack, prepares Connie for an ultrasound scan on her new lump. The scan works in the same way as it does on humans but horse hair and the grey pigment in Connie’s skin makes the reading harder, so care must be taken that nothing is missed. After 20 minutes, David and Giulia are happy Connie does not have a tumour and that the swelling may be more of a fatty deposit. Her owners are delighted as she can now have the standing laser surgery on her tail melanomas as planned rather than a more complicated surgery under general anaesthetic in the operating theatre. 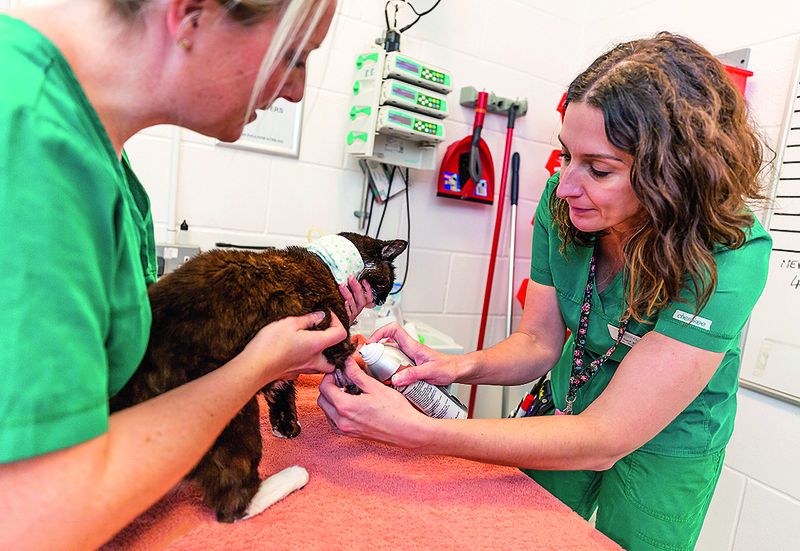 Experienced veterinary nurses Rachael Jones (right) and Francesca Pleavin (left) have mastered the technique of keeping Onion, a female cat with stage 2 kidney failure, calm and still while she has her blood checked and dressings changed. “I love my job. I enjoy watching the students learn and progress – we often take them under our wing. We’re all animal lovers with pets of our own and get on really well. And of course it’s so rewarding seeing the animals get better and go home,” says Francesca. This state-of-the-art Tesla MRI scanner had to be fitted using a rail track as the massive magnet inside weighs six tonnes. The wall of the diagnostic imaging suite had to be removed and then rebuilt, and the eventual cost of the fitted unit was £1 million. 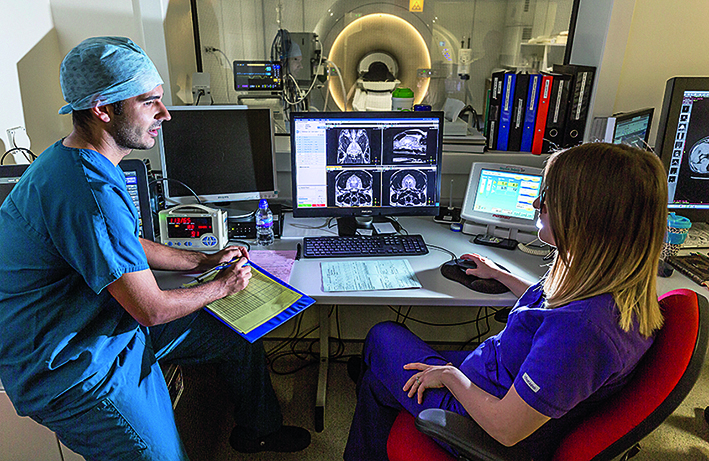 This crucial technology ensures that everything can be done in-house very efficiently, from diagnosis to surgery and then being allowed to go home, explains radiographer Hannah Caswell. 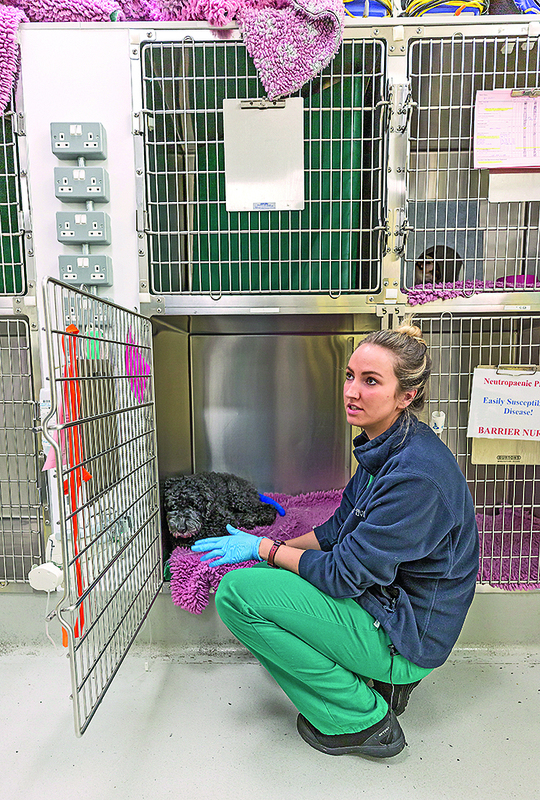 “This reduces stress for the animals and their owners, who are given news within one hour of their pet being scanned.” Anaesthetist Oscar Bautista stays to monitor Oscar, a large Labradoodle who has a suspected brain tumour, as the scan takes about an hour. A typical scan of a dog costs £1,000 plus sedation. Missy will now go back to the ward with Julia Blakemore, an oncology veterinary nurse, to rest and be checked that she has no adverse reactions so her owners can take her home later. Performed up to eight times a week at the hospital, the TPLO surgery (tibial plateau-levelling osteotomy) on today’s patient – a springer spaniel – takes around an hour and a half and will change the angle of the top of the shin bone by cutting the bone, rotating it, and stabilising it in a new position with a plate and screws. 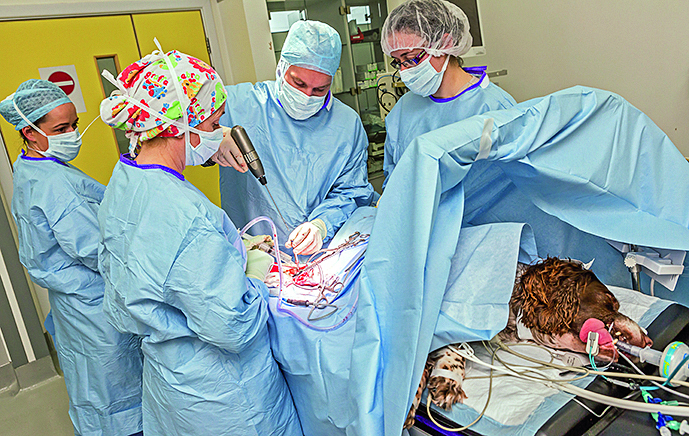 Resident surgeon Tom Cox is performing the operation assisted by Professor Eithne Comerford (in the animal scrub hat). 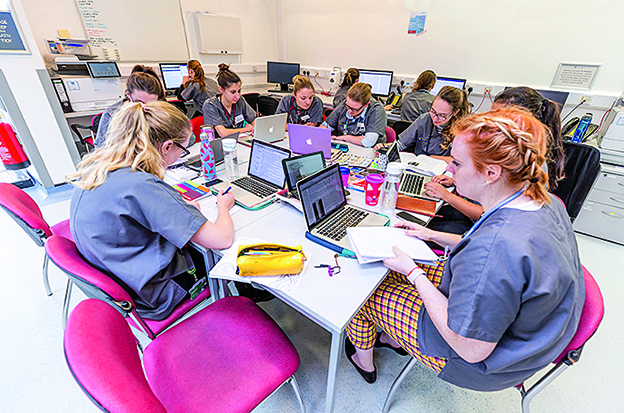 There are around ten staff in the room assisting or observing and this is made possible by the huge medical screens on the walls which provide a live feed for students. All photos by: RICHARD STANTON.